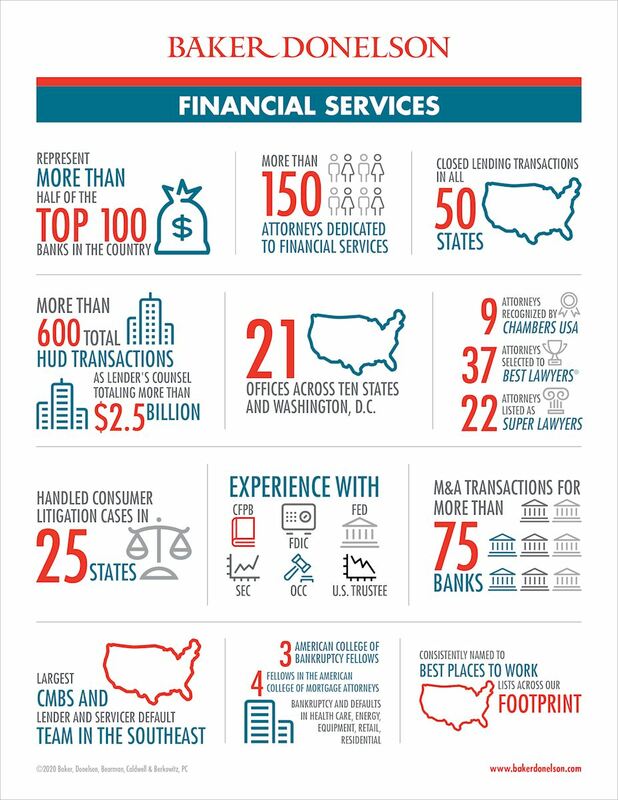 With more than 140 attorneys dedicated to financial services, Baker Donelson is committed to representing clients across a broad spectrum of the financial sector. Energy Default and Restructure Team Baker Donelson's Energy Default and Restructure Team has decades of experience in the oil and gas industry. With more than 140 attorneys dedicated to financial services, Baker Donelson is committed to representing clients across a broad spectrum of the financial sector. Our team-based approach allows us to provide prompt, high quality, cost-effective legal services and industry insight for regulatory, transactional and litigation matters. Our clients include all sizes of national and state chartered banks providing commercial and investment services; bank holding companies and bank subsidiaries; independent and captive finance companies; financial services companies; public and private investment funds; residential and commercial mortgage servicers and special servicers; trusts; wealth management companies; insurance companies; and vendors providing goods and services to the industry. Invested is what I like to call them. There are law firms that work for you and do a good job, but with Baker Donelson they take it personally if the bank loses – as personally as I do. And that is a good thing. The Bankruptcy Code is 40 Years Old and We Are Still Learning!